The business success of the Argentine tango posed a threat to the American record and film companies following the Great Depression. An all out attack was launched to sell the entertainment products coming from the North to a new generation of Argentines, and one of the main ingredients of the strategy was to destroy the tango as a favorite pastime for many residents of Buenos Aires. The untimely death of Gardel in 1935 supported an orchestrated marketing campaign that resulted in the now legendary headline published in one of Buenos Aires dailies: “The Tango is Dead.” That was going to prove to be a major blunder. A friend recently wrote from Buenos Aires to remind me that history is written by the winners, and that Americans and British tend to look at the world from a winner’s position and sometimes assume ownership of things that don’t belong to them. I’m not sure what to make of that. Maybe he’s been reading absurd messages on the Internet. However I agree when he added that the tango, being Argentine like the Pampas and the ombu, can tell its own history from a vantage viewpoint. Even so, there are aspects of tango history which are biased depending on the agenda of those in a position to influence public opinion. Horacio Ferrer, president of the National Academy of Tango has written in his book History of the Tango: In 1935 Rodolfo Biagi, with his nervous pianist modality (harmonically elementary and rhythmically monotonous because of the invariable repetition of the same musical ideas), joined the orchestra of Juan D’Arienzo, contributing to define the interpretative style of the combo. The dancing section of the tango stands knows not to trust those yielding power solely by the nature of their political or social affiliations, but many outsiders (metaphorically and geographically speaking) tend to repeat (and believe) as words from some sacred gospel, the obvious put down that elitist Ferrer dishes out to one of the musicians responsible for changing forever the history and fate of the tango music in the 1940’s. Dancers became a motivational force with a strong say in influencing the way tango music for dancing should sound. Rodolfo Biagi played a very important part in the history of tango, particularly in regards to the renaissance of the dance craze that has become to be known as the Golden Era of tango. A pianist, Biagi seems to have been unjustly forgotten or maybe shortchanged when it comes to highlighting names in the gallery of tango’s greatest figures. With an undeniable talent and a spirit characteristic of the natives of the city of Buenos Aires, Rodolfo Biagi injected a much needed, and later to become a well-known and fruitful change, in the music of Buenos Aires. The enormous success of the orchestra of Juan D’Arienzo during the 1936 Carnaval season, with its strong and accelerated emphasis of the forgotten 2×4 rhythm led to a decade of extraordinary activity among musicians, singers and dancers between 1935 and the late fifties. The energetic and original treatment of the piano by Rodolfo Biagi set new standards for that instrument, and forced the rest of the orchestras to vary their styles, and many pianists assimilated the influence of the new rhythm in vogue. Heading into 1940, the tango began perhaps its most fruitful period. It all began when Rodolfo Biagi joined the orchestra of Juan D’Arienzo in 1935. Soon after, other orchestras abandoned their romantic (and at times dense) style characteristic of the late twenties and early thirties. They opted for a more upbeat playing style to please the increasing demand of the dancers. The tango scene became brilliant, the quality of the musicians shot upwards, and the personality of the singers blended within the new musical structures as another instrument that responded to the needs of the dancing public. a massive emigration of people from the provinces to Buenos Aires. Between 1940 and 1949 the following orchestras registered the indicated number of recordings. People can’t control, choose nor decide where and when they will be born. These circumstances, particularly at the beginning of the twentieth century in Buenos Aires, would unfortunately affect negatively the future of many talented people. Such was the case of Rodolfo Biagi, born in the working class district of San Telmo on March 14, 1906, into a the bosom of a humble family. The desire of immigrant parents to forge a future for their sons and daughters through education played an important role in the decision to enroll young Rodolfo as a non-paying student at a conservatory. By the time he turned thirteen, Biagi had graduated from the Conservatory of La Prensa, where he had been coached to be a concert violinist, but in the course of his studies converted to piano. At the suggestion of one of his teachers he continued to widen his knowledge at the Conservatory of the Anglican Church, while he earned his first money as a pianist in one of the many movie houses featuring silent movies. There he discovered the legendary Juan Maglio “Pacho”, and at barely fifteen years of age was invited by Maglio to play in his orchestra. The setting could not have been more auspicious, none other than the cafe El Nacional on Corrientes Street, the Olympus for fans of the tango. From that moment in time Rodolfo Biagi had to juggle his performances with “Pacho”, his performances on Radio Cultura and his studies of teaching methods at the Mariano Acosta college. On parting with Maglio, he joined Miguel Orlando’s formation at the Maipu Pigall cabaret, and in that place he met Carlos Gardel, who was a habitual client of that establishment. Gardel proposed that he accompany him on some recordings together with his guitarists Guillermo Barbieri, Jose Maria Aguilar and Domingo Riverol, plus violinist Antonio Rodio. These recordings took place on April 1, 1930. The order of titles waxed was as follows: the tango Buenos Aires, the fox-trot Yo naci para ti, tu seras para mi, the waltz Aromas de Cairo, and the tangos Aquellas farras and Viejo smoking. After this recording experience, Carlos Gardel offered him a trip to Europe as his accompanist, but Rodolfo Biagi chose to remain in Buenos Aires. 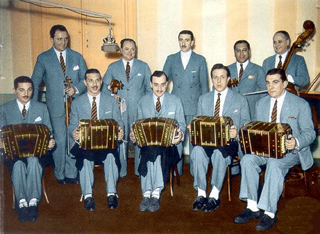 At the beginning of the thirties we find Biagi at the piano of accordion player Bautista Guido’s sextet and in 1935 he was with Juan Canaro’s orchestra on a successful tour of Brazil. In Buenos Aires they enlivened the shows at the Teatro Cine Paris which were broadcast over LS9 The Voice of the Air. With Juan Canaro he began to develop his personal style, a style which reached its zenith in 1935, a time of crisis for the tango for the reasons mentioned before. The socio-economic and political situation of the country had brought the tango and its people to a crossroad which was difficult to resolve. Many orchestras dissolved for want of places to play. The invasion of strange foreign rhythms, advanced by the ruling classes of the nation, and “supported” by a docile middle class, sent the business of tango into a tailspin; in this desolate environment for the popular music of Buenos Aires, a miracle aroused at the hands of Rodolfo Biagi. It was then that Biagi was contracted by Juan D’Arienzo to take the place left vacant by Luis Visca. The tandem D’Arienzo-Biagi propelled the movement which produced the rediscovery by the people of their music. Rodolfo Biagi’s contagious sound emanating from his piano, fully coincided with the aesthetic postulates of Juan D’Arienzo, the popular style that at the time some qualified as simplistic, too fateful for the tango’s future. In fact, the tango establishment, the kind that meets to talk about things others do, never acknowledged D’Arienzo as a major influence for the tango. The king of the rhythm laughed all the way to the bank, but that is another story. It was the common citizens who were the real depository of the culture which pertains to them and things were finally put in their rightful place, the public responding with its multitudinous presence at the performances of D’Arienzo with Biagi. A new rhythmic line was imposed and it was rapidly adopted by other orchestras and a new generation was born which brought about a great resurgence in the forties decade. Rodolfo Biagi was with Juan D’Arienzo until 1938, the year he formed his own orchestra.